Curran can provide exchanger and condenser tube repairs using alloy tube ferrules made of a corrosion resistant alloy. Hydraulic expansion of ferrules ensures uniform expansion, resulting in long term condenser restoration. Curran can install ferrules or sleeves to inhibit fluid velocity erosion and turbulent condensing gases that lead to localized wear. Ferrules provide improved wear resistance so that the tube end and its sealing integrity with tubesheet sheet is maintained. Ferrules and sleeves are typically 6” to 18” long sections of cut to length from annealed tube stock, flared and chamfered at opposite ends. The installed ferrule/sleeve serves as a wear plate to decrease the damage done to the parent tube due to inlet erosion. The ferrule or sleeve can be replaced after it has outlived its usefulness. Hydraulic expansion of tube end ferrules and sleeves is the premier method for installation, expanding the complete length of the ferrule to intimate contact with parent tube. This method is achieved by introducing water at a high internal pressure within a sleeve, between two seals, to expand the sleeve to a point of contact between the sleeve and the parent tube. No single point of expansion; hydraulic method expands entire length in one operation. Minimal “work hardening” of ferrule during expansion, suitable for wide range of alloys. Curran International has an inventory of high pressure pumps and expansion mandrels are custom sized to specific application length. We source tube stock from a wide network of domestic and international mills delivering ASME/ASTM grade material. All deliveries shall have Material Test Reports along with packing slip. 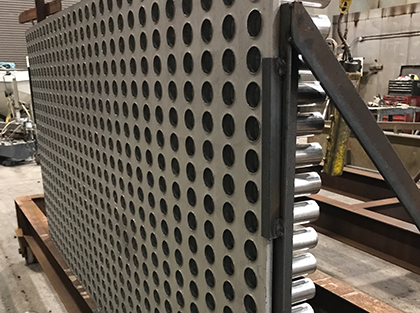 Contact Curran for installation and hydraulic expansion of tube end ferrules; Curran can provide other services – tube ID cleaning, and tubesheet epoxy cladding – for a turnkey project solution.